The Universal Cookery and Food Festival (UCFF) is to be held at Padstow this year on 20 September. 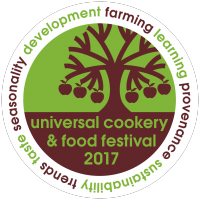 The UCFF is created and designed by chefs for chefs, celebrating food, farming, cooking and learning and aimed at professionals working in the industry. 2017 is the sixth year of the Festival and will capitalise on the rich heritage of the Cornish coast. A brand new stage will offer a rolling programme of meat and fish focused demonstrations by a host of national and local talent. In addition, there will be wide ranging talks and debates, workshops (including cider making and bee keeping). Speakers and demonstrators include Jack Stein, Rupy Aujia (The Doctor’s Kitchen), John Walton (from Paul Ainsworth’s No. 6), Emily Scott (St Tudy Inn), Simon Hulstone ( Michelin Starred Elephant Restaurant, Torquay), Adrian Bartlett (Crabstock Shellfish Festival), and Mark Hayward (Dingley Dell Pork). There will be a “Great Taste Market” of local and national food producers, foraging tours of the coastline, and food, beer and other refreshments plus live music are all included in the entry ticket. Hosted at Padstow Farm shop, full details can be found at www.cookeryandfoodfestival.co.uk. or telephone 01293 852376.